How, oh how has an entire month slipped by and I haven't blogged. Did you miss me? Did you think I slipped off the face of the earth? I've been here…and I did miss YOU! It's been exciting here in the studio. I've hosted a booth at the Scrapbook Expo here in Milwaukee the first part of May, then Adria graduated as did her bff, Caleb. Caleb's mom and I hosted their graduation party and we kinda joked that hopefully it's a dry run for bigger things to come. SHhhhh…don't tell them we said that. :) Still working extra days at the hospital and trying desperately to get things in the ground here in the garden. I'm a little afraid I'm losing the war….Now it's time to switch gears and focus on Camp that's coming up in 3 short weeks. 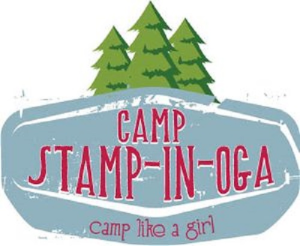 Have you been to our Camp? It's the best camping experience around. No mosquitoes, no rain, no hard ground and cold sleeping bags…just stamps, paper and ink and a little food thrown in for good measure. Saturday, June 23rd. Be there. Here's a registration link. 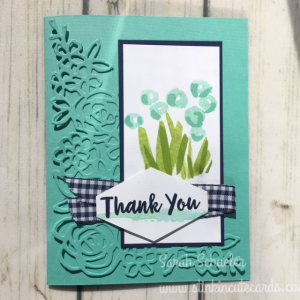 Here's one of the Cards that we will be stamping at camp. Totally cute, hey? It's using the brand new Abstract Impressions stamp set. LOVE it…so summery! See you at camp! You will love it!